A Tomb with a View | Where's my backpack? 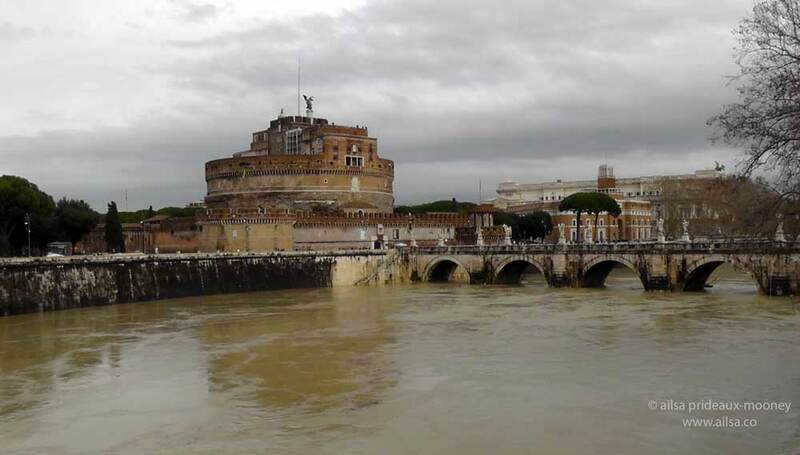 The first time I laid eyes on Castel Sant’Angelo, looming large over the banks of the Tiber, a chill ran down my spine. … but once the angels were behind me the castle scowled down once more, redolent of murder and intrigue. It started life as a mausoleum commissioned by the emperor Hadrian and completed by his adoptive son a year after Hadrian’s death. For years it housed the ashes of Hadrian and many other notables including Septimius Severus, Marcus Aurelius and his son Commodus, but in 410 AD, Alaric and his merry Visigoths hit town and left a trail of destruction in their wake, ransacking the city and castle, scattering the ashes to the four winds. It lost its function as a tomb and became a fortress, gaining its present name in 590 AD when Pope Gregory saw a vision of the Archangel Michael atop the mausoleum. Rome was plague-stricken at the time, so the canny Pope struck a deal with the apparition; he would build a memorial to the Archangel if he could make the plague go away. The plague duly went away and Gregory kept his promise which is why the present structure is adorned with a statue of the Archangel. The angel on the roof is a ‘new and improved’ angel installed in 1753; the original marble angel now lives in the Courtyard of the Cannonballs. Now the Popes took over the castle, using it as a residential castle and a place to guard their treasures and ever-increasing wealth. Pope Nicholas III ordered the building of an elevated, fortified passageway connecting the castle to Vatican City. Known as the Passetto di Borgo, it facilitated the escape of several popes in peril. The infamous Pope Alexander VI (he of the many mistresses and offspring including Cesare and Lucrezia Borgia) hot-footed it down the Passetto di Borgo in 1494 and hunkered down in the castle when Charles VIII invaded the city. 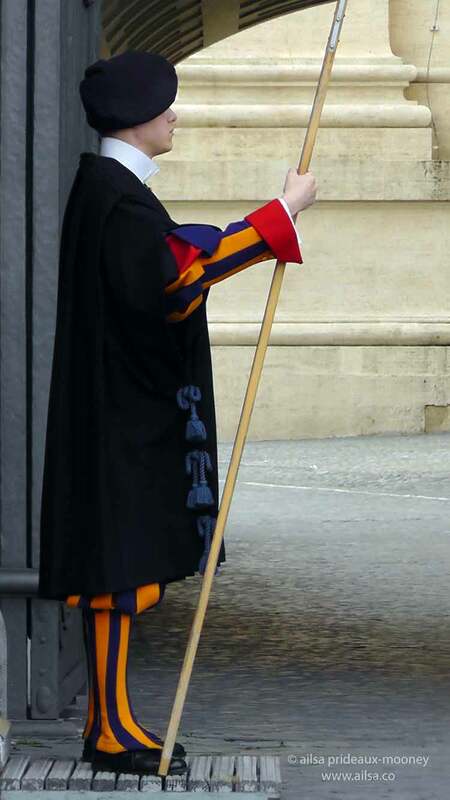 Later still, Pope Clement VII hoisted his cassock and legged it along the passageway during the Sack of Rome in 1527. While the Pope camped out in the safety of the castle, the Swiss Guard were massacred. But the bloodshed didn’t end there. While the papacy stashed riches and entertained mistresses upstairs, the lower levels were used to incarcerate, torture and execute political prisoners. Philosopher Giordano Bruno was held here and interrogated by the Roman inquisition for championing the heliocentrism that Copernicus had made so popular. He also suggested that the sun was just one of many stars in the sky; postulating that there could be many worlds such as ours circling many stars out there in the universe. Unlike his contemporary Galileo Galilei, Bruno refused to recant and was burned at the stake. More often than not, however, the bodies of executed prisoners were displayed on the bridge as a warning to would-be miscreants. No wonder the place gave me the shivers. Puccini set his opera Tosca here during the time it was an active prison. The eponymous heroine, upon discovering her love had been executed, threw herself off the roof of the castle and plummeted to her death. Nowadays there’s a cafe on the rooftop terrace, so you can sip a cappuccino and take in the awe-inspiring view Tosca would have enjoyed on her way down. This entry was posted in Europe, Italy, Photography, Travel and tagged history, humor, photography, photos, pictures, travel, writing. Bookmark the permalink. Informative post, good photos, great title! Fantastic history. I’ve learnt something. Thanks Ailsa. You’re welcome, Trish, I’m glad you enjoyed it, it’s a fascinating, if somewhat ominous, place. I love the last line of your post! Thanks Katie, yes, it was a pretty eerie place to wander round. Much good information here, along with your excellent writing! Thanks for posting. I’ve never been here, so it’s good to know the original intent as well as what it has become. It’s had quite an extraordinary history, Rusha, definitely worth a visit! Thanks for the historical info, Ailsa. It always amazes me how humans have come up with the most creative ways to torture and kill other humans for the sake of power, basically. You picked up on the evil energies in this place… I’ve gotten shivers like that in various historical places myself. …hoisted his cassock and legged it…… …. the view Tosca would have enjoyed on her way down. Oh dear! you do have a turn of phrase…I really shouldn’t be made to laugh so in a public library!! Interesting and informative post. Like. An excellent pocket history lesson! Fascinating! I’d love to go there to feel the atmosphere you describe. It’s quite an unnerving place, but beautiful too! I love the Castel Sant’Angelo. Did you get to go inside, Ailsa? Any excuse to go back to Rome is a good one! I’ve only been once so far, but Rich first went there before we met. 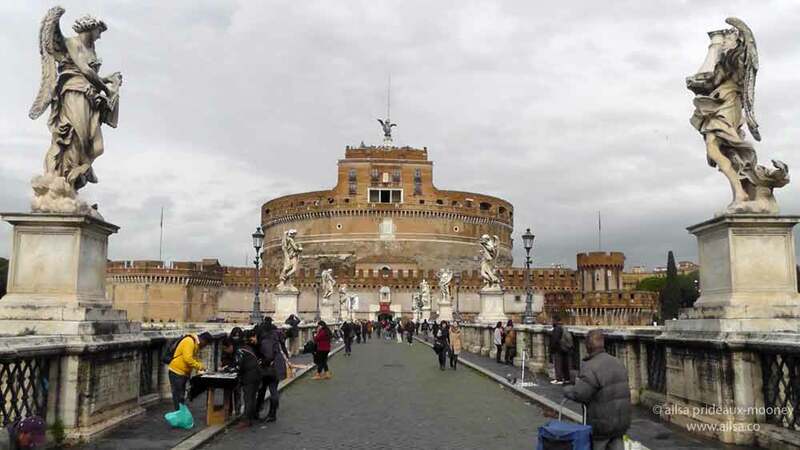 One of his excuses for returning was that he didn’t get to go inside Castel Sant’Angelo the first time around. I imagine they have my photo with a cross bar through it in the tour guide office. Whew, fascinating history in a not so pretty building! Your last paragraph clinched it for me – absolutely love your travelogues! Your storytelling gives good credit to the whole story – full of facts but enjoyable!